We would call the Amazfit Bip Smartwatch by Huami one of the best-kept secrets in consumer tech, except our readers know all about it because the BGR Deals team has covered it a bunch of times in the past. If you’re not one of the many thousands of readers who have already bought one though, you should definitely check it out before you buy a pricier smartwatch. 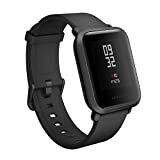 It works with iPhones and Android devices, it has all the great features you want in a smartwatch like notifications as well as sleep and activity tracking, and it lasts a full month on a single charge. All that for $79.99!